I must apologize for letting this blog go unpublished for so long. Bad weather, family events, health issues and just life got in the way. And time flew by. Unfortunately, our kites weren’t flying half as much. We missed several of our favorite kite festivals. Even our local kite festival experienced its first cancellation and 25 years. As I attempt to resurrect this blog, it seems appropriate that it is also the start of National Kite Month. We’ve managed to get to the beach a couple of times this past week. The wind was low and gusty but the sun was warm. I have acquired some new kites recently and finally got a chance to fly them. One is a custom Rokkaku built by Randy Tom. It is titled The Cat and is #2. Number 1 is owned by my friend Brett Dixon. 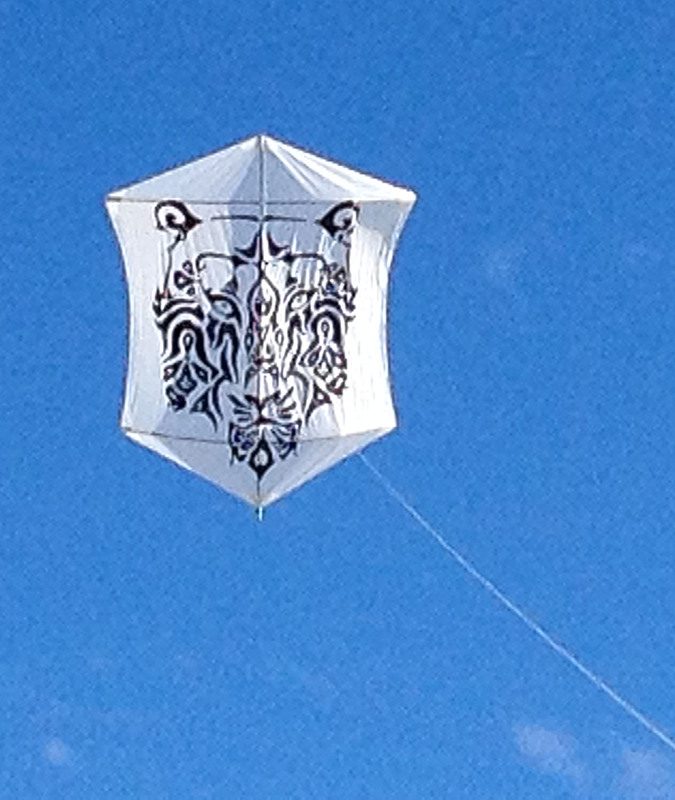 It is a striking kite, looking like a tattoo in the sky. 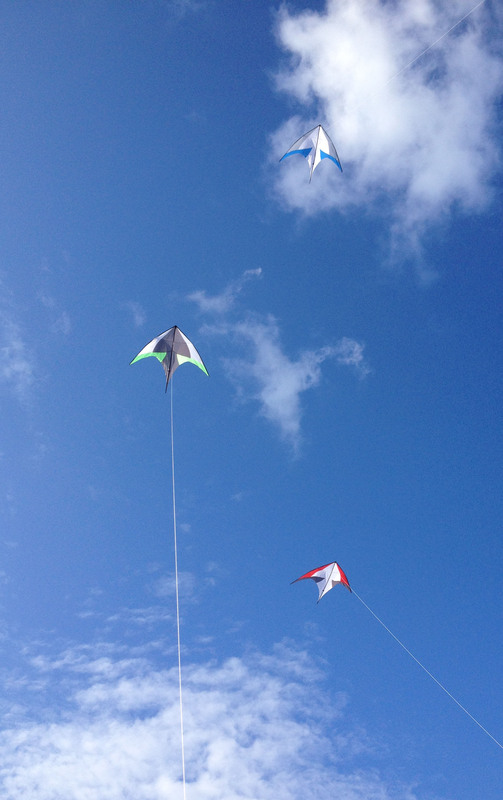 Another is a train of kites I built at a kite builders workshop in Raleigh, NC last October. The workshop brought in Tasmanian kite builder Robert Brasington to show us how to build a couple of his more popular kites and some wind spinners. I opted to build the Waif Train. 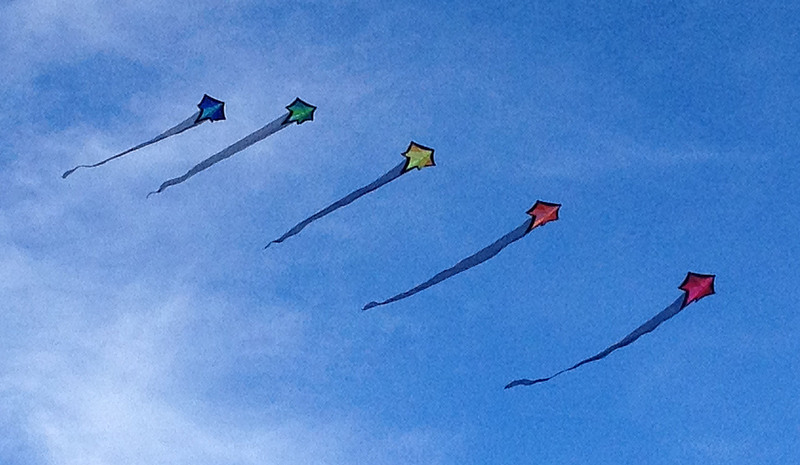 It is a multi-colored series of smaller kites with long organza tails. The complete train is made up of six kites. However, I’m sad to say I’ve only completed five. The sixth is still sitting on my sewing table. But I have flown the train a couple of times and it has always drawn appreciative looks. I am rather proud of it. When all else failed, we brought out our collection of Skates. We have all the color varieties and enjoy getting them up as a group. The Skate was designed by Paul De Bakker and is made by Into The Wind Kites. It is a low wind, no wind and indoor kite. It goes up with almost no effort and hangs in the sky. I’m beginning to sound like a commercial. But it is handy to have at least one of these kites in the kite bag at all times. Along with sharing what we are flying and when and how, I’m going to document my latest kite building venture. 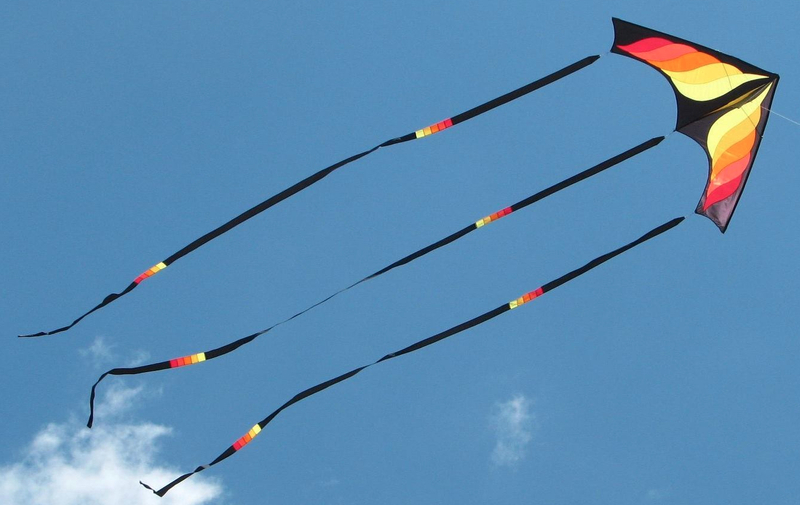 I have thought a long time about what project I wanted to undertake and have decided on building a train of five kites. The idea began during the annual American Kitefliers Association convention in Nags Head, NC. It was re-enforced after building the Brasington Waif train. Now the project begins and, hopefully, it will be completed before our local kite festival in October. I hope anyone interested in kite flying will enjoy my ramblings and others will read this, become interested, and try kite flying.